On our wanderings through fairyland, Thalia and I chanced upon the Grimm story called The Elves, which is composed of three stories grouped together under one title. Our “wandering” takes place in my study, on a comfy chair, Thalia and Teddy at rest on my lap. Thalia does squirm a bit. Teddy, unblinking, stares at whatever it is at which Teddy stares. I recognized the first story right off. In other collections it bears the name The Elves and the Shoemaker. Two elves, inexplicably, attach themselves to the household of a shoemaker when he has reached the bottom of his fortune. At night, out of sight of the human couple, from cut-out material left for them, they sew and nail shoes together with such skill that the shoemaker soon prospers. One evening, not long before Christmas, the couple determines to discover who has been aiding them. They stay up that night, and see the naked little elves, who come into the shop, quickly perform their task, and leave. The second tale, shorter than the first, deals with a young servant girl who receives a written invitation from the elves to stand as godmother at the christening of one of their children. Uncertain about what to do, she accepts the advice of her employers that it is best not to refuse the request of the little folk. Three elves appear and conduct her into a hollow mountain. Inside the mountain, the mother of the child lies on an ebony bed with pearl finials. The child’s cradle is of ivory and its bath of gold. The elves, so pleased with the girl, beg her to stay and celebrate with them. They do all they can to please her. But, finally, when she returns home with pockets full of gold, she finds that not three days but seven years have passed, the family she served no longer alive. Thalia looked at me with concern over this turn of events in the story. Still, we wandered on. Eggshells cooked as these have been. As he laughs, elves rush in, carry him off, leaving behind her true child. Thalia, completely distraught over this story, insisted I reread the first tale before she and Teddy would take to their beds. I had to agree. But now I am alone in my study, with a pipe of Elfish Gold, and reconsidering the tales. In tale one, we find beneficial elves. In tale two, Christian elves? And with tale three, maleficent elves. What did Wilhelm want us to think about these beings when he collected three of their stories under one heading? While sitting in my study contemplating, the following thought comes into my mind. The Grimms called their collected stories Children’s and Household Tales. Our recasting the title in English as The Grimm Brothers’ Fairy Tales falls short of representing the collection’s content. The Elves, The Gifts of the Little People, The Water Nixie, and The Nixie in the Pond pretty much constitute the work’s fairy population. Would not the title The Grimm Brother’s Shoemaker and Tailor Tales be a small improvement? The thought leaves as quickly as it came. I fill another pipe with Elfish Gold, tamp it down, and reach for my copy of The Fairy Tradition in Britain. Other works of Lewis Spence make scholars squirm, but I find this volume encyclopedic and useful. I had not gotten through Chapter One, “The Fairies of England,” before it became evident that, while the Grimms called the little beings who aided the shoemaker “elves,” they were clearly brownies. The brownies of England and Scotland attach themselves to a household, doing domestic and farm chores religiously, if out of sight of the family. However, they are easily offended, and not above playing tricks on their hosts, taking their revenge on the unsuspecting. All that the brownies require is a bowl of milk left out nightly where they can find it, almost by accident. A taboo stands in place about giving anything directly to a brownie. In some stories that Spence relates, families, with good intent, reward their brownies for their labors with new clothing, a gift the brownie may or may not accept, but, in any case, the brownie will certainly disappear never to be seen again. The tale in which the serving maid stands as godmother, I find suspicious, causing me to puff on my pipe harder than necessary. Fairies are of pagan origin. According to some, they are sprung from hell, being fallen angels. Why on earth—or under the earth—would elves hold a Christian baptism? In the variants of this story, a woman is often requested for an elven birth as a midwife or a nurse, which makes more sense to me. Yet, in the Aarne-Thompson tale-type index, number 476 carries the label, “A midwife (godmother or nurse) for the elves.” With no further research, I will assume there are more than the few tales I ran across in which the elves are in want of a godmother, implying they practice Christianity. With some stories in the Grimm collection, Wilhelm put a Christian gloss over obvious pagan elements. He followed a Christian habit of co-opting pagan notions and celebrations. Both Christmas and Easter have pagan roots, and retain such elements as trees, elves, eggs, and rabbits. It comes as no surprise that storytellers, over time, have inserted their own moral values into the tales they told, although not always with a good fit. My pipe goes out and grows cold when I turn to the internet to sort out the changeling story. The changeling motif always struck me as a fairy-tale invention. 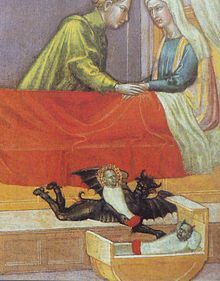 To my discomfort I find instead that from medieval times to the nineteenth century the belief in infants, children, and even adults being supplanted by a changeling remained current. D. L. Ashliman, on his website, has written a summary of changeling history. Here I find no one less than Martin Luther weighing in on the subject. It gives me pause. He felt, because changelings were demon born, they could be destroyed without remorse. Infants and children who suffered from physical and mental abnormalities were likely to be thought of as changelings. Remembering Thalia’s child-intuitive discomfort with this story, I, too, go back and reread the more reassuring The Elves and the Shoemaker before going to bed. The elves and brownies confusion is not Wilhelm’s fault. The word he used to describe the little fellows was Heinzelmännchen. The English translators used the word Elves. Sorting out the fairy world is a perplexing matter. One of the first attempts at classifying the fairies can be found in a legend from the Western Isles of Scotland, which made divisions of the fallen angels when they were cast out of heaven. Some fell to earth to become the fairies proper, others fell into the sea to become the Blue Men, and the Nimble Men remained in the sky. The latter appear as the Merry Dancers, or the Northern Lights. When you encounter a fairy¾which is likely at some time in your life given the troops of fairies lurking about, if underrepresented in Grimm—the problem of identification will surely arise. This fairy of yours, is it a portune, brownie, boggart, pixie, spriggan, knocker, lubber-fiend, leprechaun (they are shoemakers), hobthrust, pech, banshee (hopefully not). glaistig, bean-nighe, gruagach, buckie, uruisg, puca, bwca (not a typo), caointeach, loireag, brollachan, sluagh, or glashtyn? Maybe your fairy is of the Benedith y Manau, Tylwyth Teg, Cochion, Coblynau, Fenodyree, Tuatha di Danann … . I haven’t gotten off the British Isles with this list. Many of the above mentioned are closely related, or it simply matters in what region you are standing to determine what name to give them. The one thing about fairies we can count on to be consistent is that humans need to beware; human and fairy relations consist of interactions fraught with tension. Stories of the human-fairy relationship go beyond the simple folktale, surfacing in legend as well. I am thinking of Oisīn, the Irish warrior-poet, and his marriage to Niam of the Golden Hair, daughter of the king of the Lands of Youth. Oisīn, his father Finn, and their company ride out to hunt. The fairest of women approaches them, dressed as a queen, upon a white horse. With words and song she cast a spell on them, taking the willing Oisīn from his company. But three weeks in the Land of Youth, with all its fairy comforts, cannot quell Oisīn’s desire to be with his kin. Niam allows a visit, giving him her white horse, but warns him against setting his foot on earth, or he will never return to her. His three weeks in the Land of Youth made for three centuries in Ireland. His people had passed into legend, as well as himself. While leaning down from his saddle to perform an act of kindness, the girth breaks; Oisīn falls to the ground. The fairy horse vanishes and an ancient man lies on the earth. He is carried to Saint Patrick, whose scribe writes down Oisīn’s story before the Fianna warrior dies. Be it folktales or legends, the fairies hold a special, if dangerous, place in our thinking. Wilhelm’s choices for the three tales bound together were wise ones. They show the benevolent side of fairies; their odd, friendly disregard for their human companion’s wellbeing; and their selfish deceit toward mankind. To be honest, these good, bad, and questionable traits are not unique to brownies, elves, and other fairies. These are human traits as well. I wonder if the fairies do not represent all of our wishes, concerns, and fears projected onto these little folk. It would explain the fairies’ vast numbers.